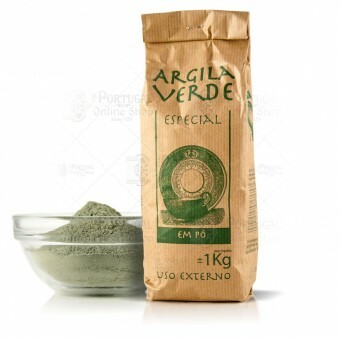 Our French Green Clay has a magnificent absorbent power. This is due to it's micro molecules constitution and present minerals . It literally "drinks" all skin toxic substances such as oils and other impurities. It revitalizes damaged skin cells, stimulating the appearance of fresh blood, toning the complexion and tightening pores. It's an invaluable help to keep your skin clear, fresh and young. Use it daily on trouble spots, or weekly as part of a complete facial mask. Collected directly from Portugal, it is completely natural, unscented and fragrance free. One facial mask takes approximately from 1 tablespoon (15g) to 1/4 cup (45g). Each 1kg pack will last for around 30 facial masks. For 1kg orders the original pack is included. For smaller amounts, we store and ship the clay in a tight safe customized paper package ensuring all the powder properties. French Green Clay also sometimes traded as Sea Clay or also known as Illite Clay is simply one of the most effective, high quality and most used mineral skin clay that can be found. Facial masks: combine 1/2 to 1 table spoon (tbsp) of the powder with 1 or 2 tbsp of water, stir it for a homogeneous mix and apply to the skin; After 10 minutes, rinse with warm water. You may as well add some drops of Aloe Vera to the mix. Oily Skins: mix 1 tbsp of clay with 5 drops of jojoba oil. Do not use to often. As a rule, once per week is advisable to prevent skin dry. Deodorizing foot treatment: A half-cup of powdered French green clay is mixed with 1/2-cup of water and 2–3 drops of tea tree essential oil. The mixture is applied to the feet, covered loosely with plastic wrap, and rinsed off after 15 min with cool water. The feet may then be rubbed with a moisturizing cream. Beauty Treatments - The absorbent properties of green clay work in beauty treatments by drawing out impurities and toxins from the skin, toning and firming while stimulating circulation. Estheticians use it to tighten pores, exfoliate dead skin, and reveal a smoother, fresher complexion. It is known to clear problem skin and heal blemishes, usually in the form of a clay mask. If you have a dry or sensitive skin complexion, you should use a clay mask only once a week, as the clay will absorb moisture from the skin along with any impurities. A green clay masks can be purchased ready-made, or you can mix it yourself from powdered clay, adding aloe vera if your skin is sensitive, or 4 or 5 drops of jojoba oil if your skin is oily.